A theoretical, three-dimensional (3D) form of carbon that is metallic under ambient temperature and pressure has been discovered by an international research team. The search for this form of carbon has remained an ongoing challenge for scientists in the field. 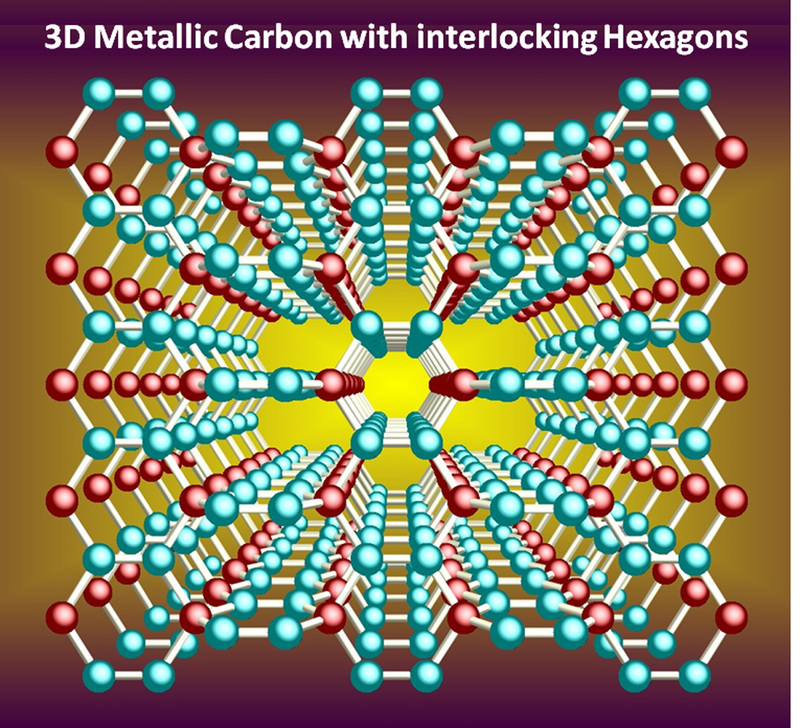 Researchers from Peking University, Virginia Commonwealth University and Shanghai Institute of Technical Physics employed state-of-the-art theoretical methods to show that it is possible to manipulate carbon to form a three-dimensional metallic phase with interlocking hexagons. “The interlocking of hexagons provides two unique features. The hexagonal arrangement introduces metallic character, and the interlocking form with tetrahedral bonding guarantees stability,” said co-lead investigator Puru Jena, Ph.D., distinguished professor of physics in the VCU College of Humanities and Sciences. “Unlike high-pressure techniques that require three terapascals of pressure to make carbon metallic, the studied structures are stable at ambient conditions and may be synthesized using benzene or polyacenes molecules,” said co-lead investigator Qian Wang, Ph.D., who holds a professor position at Peking University and an adjunct faculty position at VCU. “The new metallic carbon structures may have important applications in lightweight metals for space applications, catalysis and … for superconductivity,” Wang said. According to Jena, the team is still early in its discovery process, but hope that these findings may move the work from theory to the experimental phase. This research was supported by grants from the National Natural Science Foundation of China, the National Grand Fundamental Research 973 Program of China, and the U.S. Department of Energy. Design and synthesis of 3D metallic carbon that is stable under ambient conditions has been a long-standing dream. We predict the existence of such phases, T6- and T14-carbon, consisting of interlocking hexagons. Their dynamic, mechanical, and thermal stabilities are confirmed by carrying out a variety of state-of-the-art theoretical calculations. Unlike the previously studied K4 and the simple cubic high pressure metallic phases, the structures predicted in this work are stable under ambient conditions. Equally important, they may be synthesized chemically by using benzene or polyacenes molecules.